I have to say, Jake being super into Christmas this year is incredibly fun. Every new thing we do this season brings wide eyes and excitement. So while making my list of things I wanted to do as a family to celebrate the season, I decided just to anti-up and do an advent calendar. Each day brings a new adventure! I started by purchasing some little brown bags at the craft store. Nothing fancy. Using my number punches, I numbered each bag according to the advent countdown. Next I had to create my cards to go into each bag. I'd love to show you a picture of the file I used in Illustrator to create these, but my program literally crashed the moment after I printed them. Basically I just sized them about like a credit card and used a typewriter style font to add an activity in each box. You can fit about nine cards on a page pretty easily. Then you just cut them out! I laid all my little bags out on the table in order, and in the style of the calendar. This helped me put the right activities in the appropriate spot. Weekends were reserved for trips to the local Santa's Village or the Galaxy of Lights, whereas on a random Tuesday night our activity might be more low key, like reading a new Christmas book. Lastly I hung my calendar up on a large frame. I used simple baker's twine and tiny clothespins to attach everything. By tucking the cards inside, you can side the numbers pop even more. And as we take the cards out each day, the countdown changes! My list of things varies from reading specific Christmas books, creating Christmas crafts, memorizing Scripture about the Christmas story, watching Christmas movies, going on Christmas outings to seasonal activities, etc. You'd be surprised at how easy it is to come up with 24 things that you're basically going to do anyway. The calendar just allows you to be more intentional in planning it. And I love watching Jake get excited about the new adventure we'll have each day! 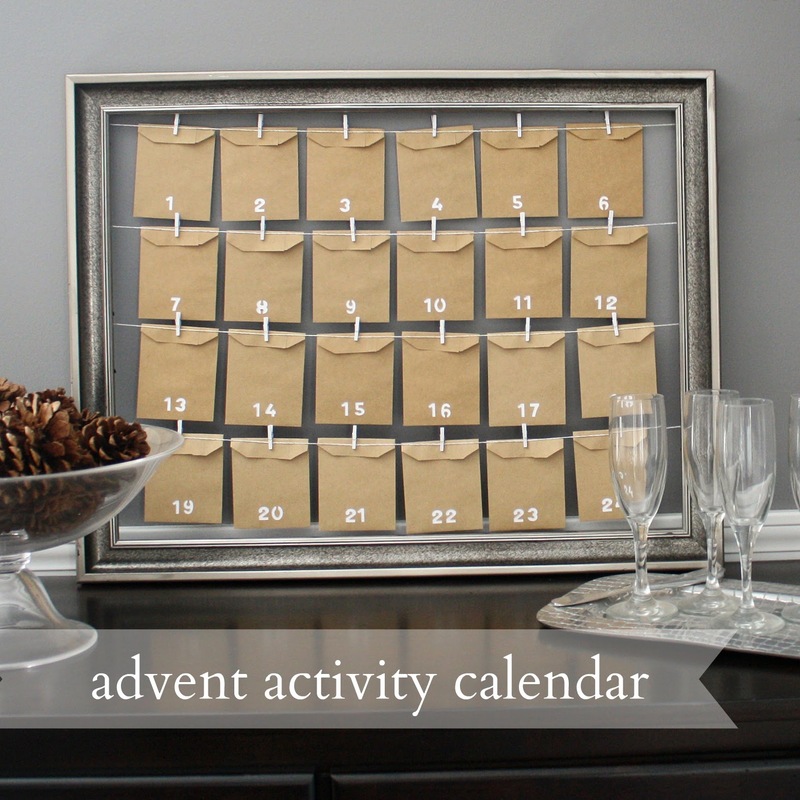 And just because its already December 4th doesn't mean you can't add an advent calendar to your celebration this year! There are so many fun things to do to enjoy this beautiful season!